Maqui berries are the fruit of the maqui plant (Aristotelia chilensis) and an excellent source of antioxidants securing several wonderful health benefits such as detoxification and cholesterol lowering properties as well as blood glucose stabilizing effects. Maqui berries, also known as maqui, maque and Chilean wineberries, are the product of a 4-5 meter tall evergreen tree occurring naturally in the Chilean and Argentinian forests of South America and cultivated in certain areas of Spain and Great Britain. These frost-sensitive berries are stirring up great interest as research on their out of the ordinary anti-inflammatory, cancer-inhibiting, detoxifying and cholesterol-lowering properties is getting at the center of public attention. What do maqui berries look like? 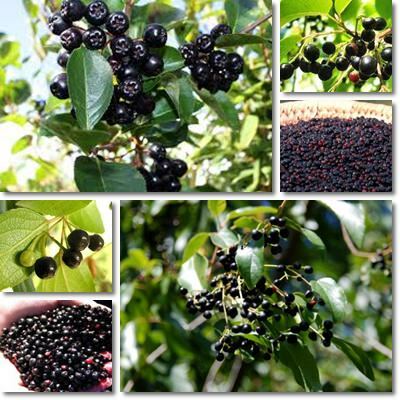 The maqui berry is a tiny, 4-8 mm, round, dark purple fruit containing 4-8 small seeds. Maqui berries grow in small bunches and look very much like blackcurrants. As is the case with all berries, sufficient rainfall during the growing period greatly influences the juiciness of the berry. Harvest time extends over a period of almost 4 months, from December to early March. What do maqui berries taste like? Maqui berries taste a lot like blackberries, succulent and sweet, with a slightly tart flavor. Unfortunately, fresh berries are a scarce sight in supermarkets and only some health food stores offer powder maqui berries supplements for sale. However, remember that the label doesn’t always match the contents, so try to be make an informed purchase whenever it comes to food supplements containing so-called functional foods or superfoods. 1) High antioxidant content. According to available research, maqui berries and maqui berry juice both rank high on the ORAC scale for antioxidant-rich foods (12th and 20th place). ORAC stands for Oxygen Radical Absorbance Capacity and measures the antioxidant capacity of fruits, vegetables, spices and various foods so as to help create a base for healthy eating. 2) Anticancer properties. When it comes to the anticancer properties of maqui berries, in vitro research has shown that the compounds responsible for the purple color of the berries, a type of anthocyanins called delphinidine, can efficiently destroy free radicals, a main cause of tumors and cancer. 3) Powerful anti-inflammatory activity. As a result of their high anthocyanin content, maqui berries exhibit an excellent anti-inflammatory activity. Inflammation has only recently been linked to chronic diseases such as cancer, diabetes, cardiovascular disease, neurodegenerative diseases and so on and it is believed that keeping it under normal parameters can help delay or even prevent the onset of a variety of chronic diseases. 4) Contributes to cardiovascular health. According to existing research, consuming maqui berries on a regular basis not only helps maintain healthy arteries as a result of the fruit’s high antioxidant content, but also helps prevent LDL (bad) cholesterol oxidation and thus protects against atherogenesis, a condition in which atheromas (abnormal fat deposits) form on the inside of our artery walls. 5) Stabilizes blood glucose and helps maintain normal metabolism. Apparently, consuming both fresh maqui berries and maqui berry juice has been found to increase insulin production which helps the body break down sugars and carbohydrates into glucose properly, making the fruit a good choice for diabetes sufferers. Improving the body’s ability to make good use of the nutrients in food also contributes to normal metabolism. 6) Has a strong detoxifying action as a result of its good vitamin and mineral content. As is the case with most berries, maqui berries too provide good amounts of essential nutrients such as vitamins and dietary minerals. Vitamins and minerals each play their part in keeping us in good health and benefits of a generous daily intake include a good immune response, low inflammation markers, good resistance to bacterial and viral infection, good energy levels and so on. Traditional medical practices recommend using maqui berries for treating diarrhea and fever. The fruits also boast and overall tonic and energizing action which recommends them for consumption. Overall, research available up to this point encourages us to eat maqui. The fresh berries, powder maqui supplements and fresh maqui juice are all good choices and can be considered functional foods, providing multiple health benefits.